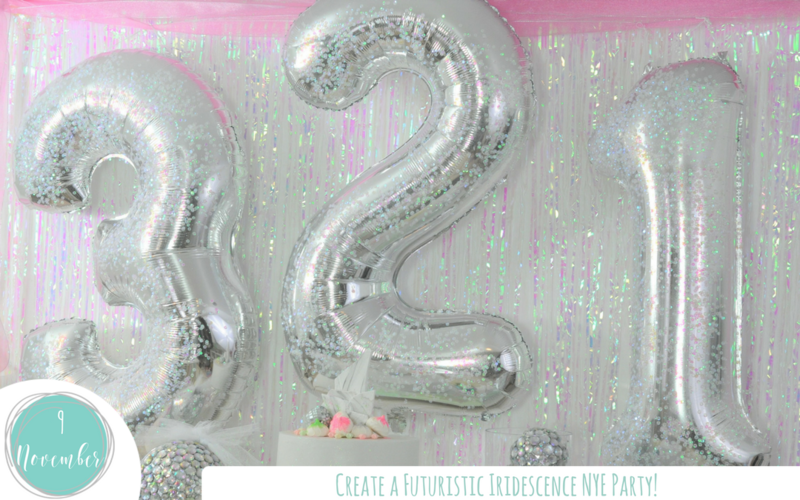 Create a Futuristic Iridescence NYE Party! Can you believe it….the holiday season is creeping up so quickly! If you are anything like me you knee deep in Thanksgiving Day preparation. Before we know it Christmas Day and New Year’s Eve will be here. Woah! Back the truck up! Yup, it’s only a few weeks away before the countdown begins. Let me help you out & reduce the planning stress. Product links to ALL of the decorations. Here is a sneak peek of what you’ll find! I created this fun and futuristic iridescent New Years Eve party after seeing a glamourous holographic tablescape created by Casa de Perrin. I loved the whole look and feel. It inspired me to create an entire NYE party around the iridescent futuristic palette with pink and blue accents. There are some fabulous iridescent party supplies out there, both Oriental Trading and BerryPom and James had a great selection. A full shopping list of products is provided on Enjoius, down to the smallest detail, even coordinating confetti suppliers! For the party supplies that weren’t available, I made use of craft supplies on Oriental Trading. I wanted to have a modern & futuristic disco celebratory feel for this New Years Party. So, I updated disco balls with a new iridescent look. You can find out how to create DIY Iridescent Disco Balls here. Another thing I struggled to find, iridescent vases! I have a quick decoupage DIY for DIY Iridescent Vases here. You’ll find the remaining DIYs including the iridescent countdown balloons and centerpieces over on Enjoius. I hope you enjoy creating this fun, glamorous and unique New Years Eve party. 3, 2, 1 you are ready to go!